How long is this going to take — maybe 50 years, as I said in my book? Wherever you find effective communication, you’ll find the ABT. You can see it in biologist Edward O. Wilson’s NY Times opinion piece yesterday. It’s so universal and yet, because it’s simple and new, some people seem so skeptical. THE ABT OF BIODIVERSITY. 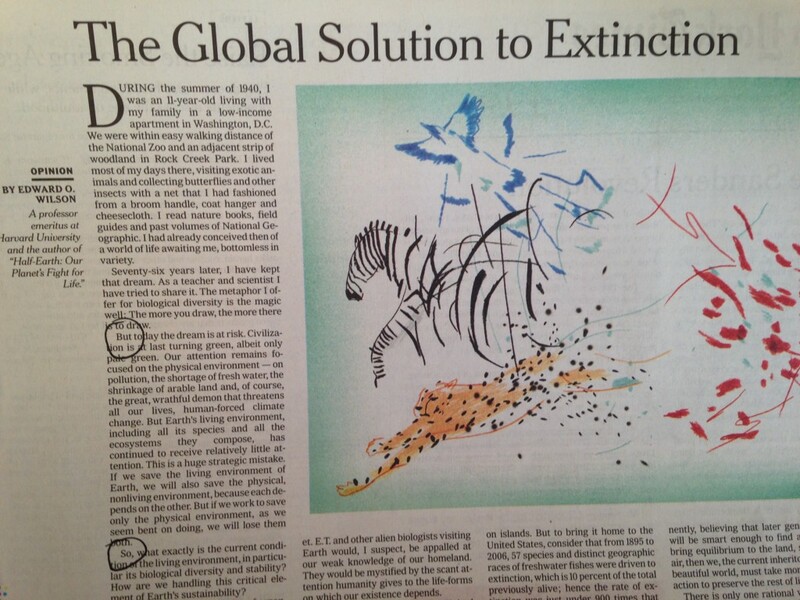 Just like the Gettysburg Address and Martin Luther King, Jr.’s “I Have A Dream” speech, yesterday biodiversity’s grandaddy Edward O. Wilson published this Opinion piece in the NY Times. Look how he starts it — with the ABT structure (using “so” instead of “therefore” as is more common). Show me good communication, I’ll show you the ABT at work. Show me bad communication, I’ll show you a lotta AAA and DHY. MUST IT REALLY BE THIS DIFFICULT? On a daily basis, down in the trenches, people are now instantly improving their communications ability through the use of the ABT. It’s at the core of our Story Circles Narrative Training which is spreading with USDA, USFWS, USGS and at least three other government agencies are working on getting involved. And yet … how do you actually get the science world behind something new? I no longer care because the ABT is just so self-validating — I don’t have to sell it, people put it to work and there’s no going back. But still, I continue to be baffled by the anti-innovative nature of science. After a few rounds of that nonsense I realized it was time to skeedaddle off to Hollywood. Life is short. Innovation is fleeting. Science kills it. And now the great irony for me is watching this happen with the one useful discovery I made in my 25 year journey through Hollywood — the ABT.